Rudolph Steiner was an Austrian philosopher who founded what is known as anthroposophy, a philosophy on which he based his experimental educational methodology on. He opened his first Waldorf School in 1919 in Stuttgart Germany. Today there are over 1,000 independent Waldorf schools, 2,000 kindergartens, 646 centers for special education within 60 countries. Waldorf education is based on the premise that there are three main stages in child development, each stage lasting about 7 years. 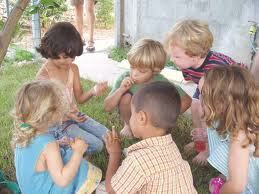 The first seven years are characterized by the need for creative play. The second stage, which corresponds to elementary school, focuses on the artistic expression and social abilities of the growing student. At this stage the focus is on nurturing creative and analytical ways of understanding. On the high school, or secondary level education deals with developing critical thinking with the goal of creative idealistic adults. The global approach of Waldorf at every stage stresses the importance of the imagination for learning with a strong value placed on integrating practical, academic and artistic goals. The ultimate goal of Waldorf education is to produce free, morally responsible and well-integrated individuals who are highly socially competent.